Over the recent years, mesoporous bioactive glasses (MBGs) gained interest as bone regeneration systems, due to their excellent bioactivity and ability to release therapeutic molecules. In order to improve the bone regeneration ability of MBGs, the incorporation of Sr2+ ions, due to its recognized pro-osteogenenic potential, represents a very promising strategy. In this study, MBGs based on the SiO2–CaO system and containing different percentages (2 and 4 mol %) of strontium were prepared by two synthesis methods, in the form of microspheres and nanoparticles. Sr-containing MBGs were characterized by FE-SEM, XRD and N2 adsorption/desorption analysis. The in vitro bioactivity in SBF resulted excellent. The assessment of fibroblast cell (line L929) viability showed that Sr-containing MBGs were biocompatible both in form of micro- and nanoparticles. The osteogenic response of osteoblast-like SAOS-2 cells was investigated by analysing the expression of GAPDH, COL1a1, RANKL, SPARC, OPG and ALPL genes, as cell differentiation markers. 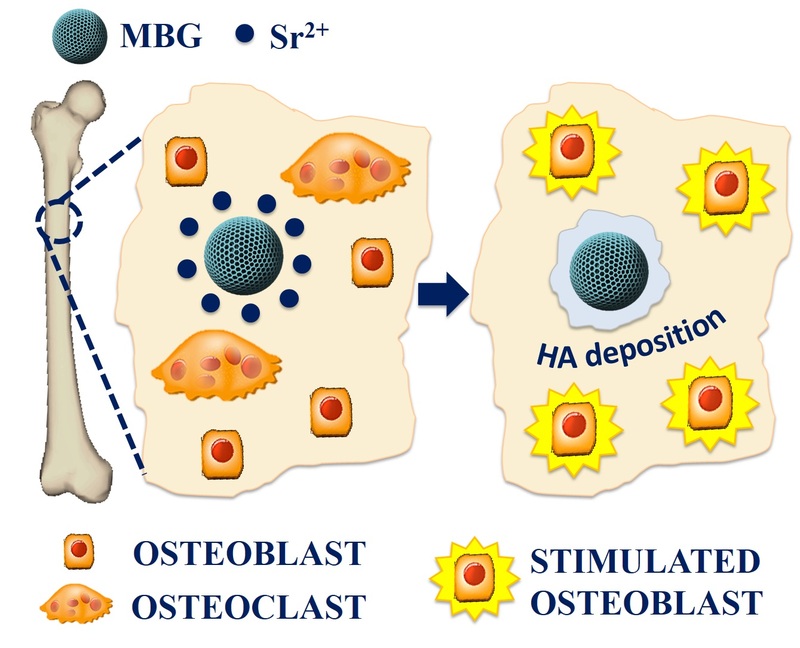 The results indicate that the incorporation of Sr into MBG is beneficial for bone regeneration as promotes a pro-osteogenic effect, paving the way to the design of advanced devices enabled by these nanocarriers also in combination with drug release, for the treatment of bone pathologies, particularly in patients with osteoporosis.